Chasing Davies: Virtual Baby Shower: Huge Giveaway! 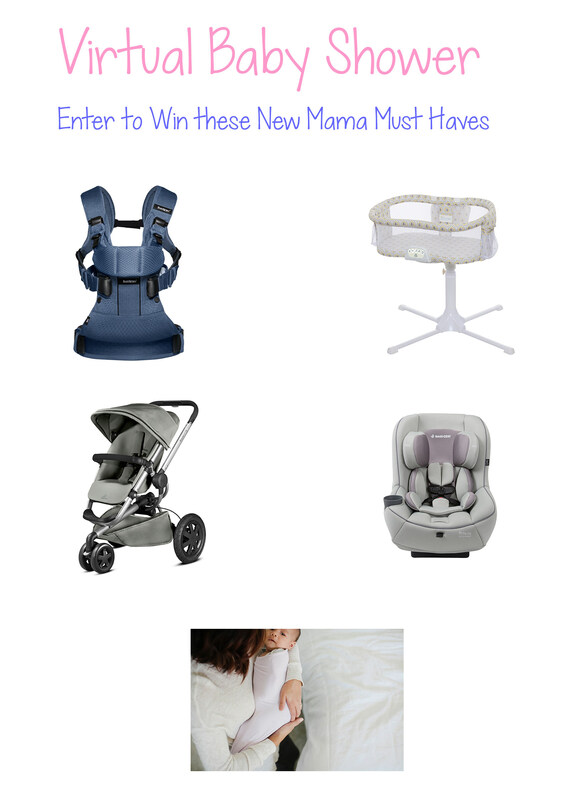 Virtual Baby Shower: Huge Giveaway! Hey guys! I've partnered up with some of my favorite mama-bloggers to bring to you some of the best baby brands for a Virtual Baby Shower! Each year a few of us mamas team up with our favorite brands to share our favorite new mama must haves, and to give one lucky mom to be a stellar gift. Yup, one of you will win ALL of these items! What are our new mommy staples? 1. HALO Bassinest Swivel Sleeper LUXE: The newest arrival to its family of safe sleep products – the HALO Bassinest Swivel Sleeper LUXE, which includes a soothing center with night light, 3 lullabies, 3 soothing sounds, 2 levels of vibration, a nursing timer and a coordinating storage caddy that provides additional space to keep baby’s essentials right at your fingertips. It also features a new floor light to help you see without disturbing your baby or your partner - ideal for helping you see the floor when getting in and out of bed. The HALO Bassinest has a unique dual-swivel design, which allows baby to sleep as close as Mom wants - even right next to her in bed, but it allows baby to sleep in his own separate sleep area, reducing the risks associated with bed-sharing. I SO wish I had this with my two babies! 2. BABYBJÖRN Baby Carrier One Air: The new Baby Carrier One is the very latest baby carrier from BABYBJÖRN, recently updated in fall of 2015 to create a more comfortable and ergonomic carrying experience for both you and your child! Acknowledged as a a hip-healthy baby carrier by International Hip Dysplasia Institute, the BABYBJÖRN Baby Carrier One allows you to switch between four ergonomic carrying positions: newborn facing-in (no infant insert needed! ), older baby facing-in, older baby facing-out and back-carrying. The Baby Carrier One is equipped with an extra sturdy waist belt for added pressure relief, allowing you to support your child's weight on your hips, and avoid potential back and shoulder discomfort. BABYBJÖRN also significantly increased the padding in the form-fitting shoulder straps to help you comfortably and safely carry a growing child from newborn up to the age of three years. The carrier is made of a super soft and airy 3D mesh fabric that allows you and your child to enjoy your all-important closeness while staying comfortably cool – perfect for getting around during the hot summer months! Other improvements, such as lock-in-place zippers, will make for an overall better babywearing experience. 3. Quinny Buzz Xtra: With its robust design and tough wheels, the Buzz Xtra will smoothly take on any terrain beyond the city limits and across the globe. Thanks to a special patented design, the practical and functional Buzz Xtra unfolds automatically within seconds with the single push of a button. In addition, an extra-large canopy and extra padding provide comfort and protection for those all-day adventures. We LOVE this brand for strollers (see here and here!). 4. Maxi Cosi Pria 70: Praised equally for safety and comfort, the latest generation of the Pria 70 is a cut above the rest. The Pria 70 is known for advanced safety utilizing FlexTech™ for multi-directional crash energy management and Air Protect® for advanced side impact protection. Fully equipped with new premium self-wicking fabric that deodorizes and draws liquids away from the skin to help keep baby dry and comfortable, the Pria 70 truly provides the ultimate comfort for children and convenience for parents. 5. Ollie Swaddle: The award-winning Ollie Swaddle is a totally unique swaddle that’s made better, feels better and helps your baby sleep better. The Ollie is named after and invented for a baby boy named Oliver—a foster baby that wasn’t thriving until Ollie Swaddle founder (and his foster mom) Hindi developed it. It helps improve the quality and duration of sleep for all babies (including preemies and high risk) and helps baby self-calm. The Ollie Swaddle has been shown to reduce fussiness/colic and help babies sleep. Not only does it reduce stress in preemies and high-risk infants, but it also helps keep baby in a safe, supine sleeping position and prevents sudden jerky arm and leg movements that wake babies up. The elasticity allows for freedom of movement while the opening at the bottom makes it easy to change diapers. The new Nature Collection features four new colors—Lavender, Sky, Nest and Stone— which are soothing, calming, and sleep-inducing. Certain colors and patterns can be over-stimulating to your little one’s eyes and consequently could have the opposite effect of soothing. The new colors will make baby feel calm, comforted and at peace. Retails for $59. Make sure to check out all the mamas throwing this party!